Human CD32b, His Tag (SPR & BLI verified) (CDB-H5228) is expressed from human 293 cells (HEK293). It contains AA Ala 46 - Pro 217 (Accession # P31994). The protein has a calculated MW of 20.4 kDa. The protein migrates as 25-33 kDa under reducing (R) condition (SDS-PAGE) due to different glycosylation. 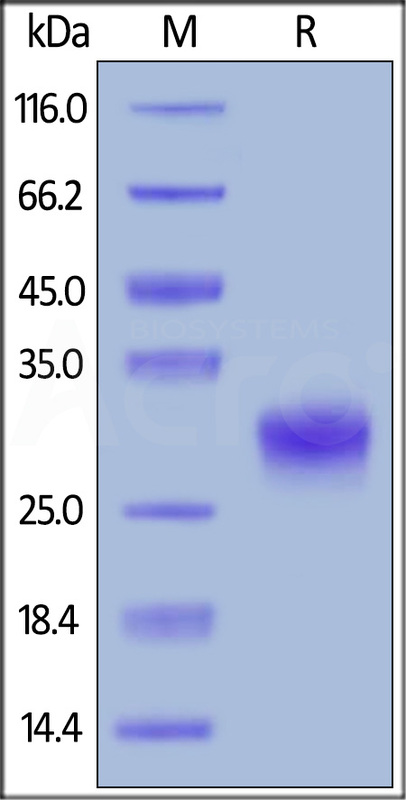 Human CD32b, His Tag (SPR & BLI verified) on SDS-PAGE under reducing (R) condition. The gel was stained overnight with Coomassie Blue. The purity of the protein is greater than 95%. Immobilized Human CD32b, His Tag (SPR & BLI verified) (Cat. No. CDB-H5228) on CM5 Chip via anti-His antibody, can bind Rituximab with an affinity constant of 10.1 μM as determined in a SPR assay (Biacore T200) (QC tested). Immobilized Rituximab on CM5 Chip, can bind Human CD32b, His Tag (SPR & BLI verified) (Cat. No. 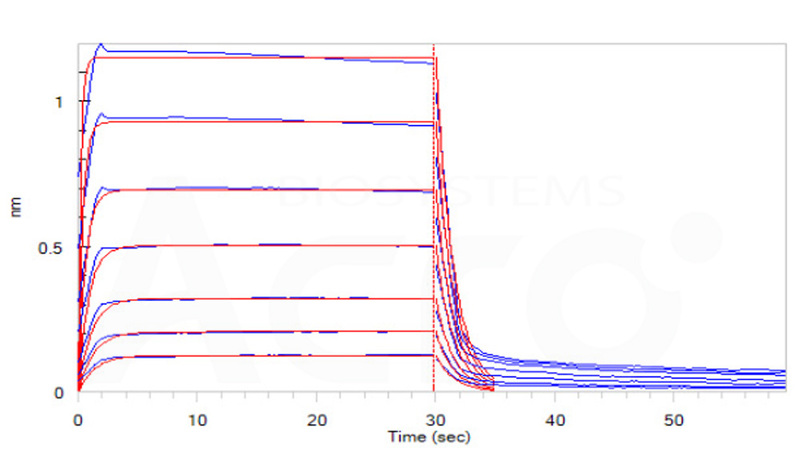 CDB-H5228) with an affinity constant of 5.5 μM as determined in a SPR assay (Biacore T200) (Routinely tested). Loaded Human CD32b, His Tag (SPR & BLI verified) (Cat. No. CDB-H5228) on HIS1K Biosensor, can bind Rituximab with an affinity constant of 4.30 μM as determined in BLI assay (ForteBio Octet Red96e) (Routinely tested).